Jacqui Lee has released her new Single “All I Have”! Check out the music video at her website! “All I Have” is available now on iTunes! Great work Jacqui! 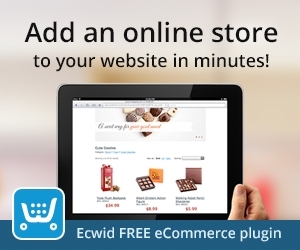 To sign up for your online store please contact me or visit Ecwid today! Ecwid has released a major new update that will prepare your store for the future of mobile commerce. Responsive design is now available to all our merchants, which will dramatically improve your store’s layout on all mobile devices. In this post we will describe what it means for you and how you can benefit once you activate the feature. Nowadays we’re connected and online almost 24/7. Smartphones have greatly changed how we communicate with each other, obtain information and interact with the world around us. For example, Americans who own smartphones or tablets spend almost 3 hours on average each day “glued” to their mobile devices. It is truly amazing how mobile became such a vital part of our lives. However, the changes are not only about mobile or smartphones usage alone. They’re also about multi-device and multi-screen web access. Today we can access the Web from the many different devices available – desktop PCs, laptops, smartphones and tablets of different screen sizes and shapes, game consoles, Smart TVs and even exercise bikes. In the Google’s study into the behavior of PC, smartphone, and TV users, Google found that 90%of their participants used multiple devices sequentially and 81% used multiple devices simultaneously. Moreover 65% of shopping online started on smartphones. This means that e-commerce is changing again and online stores must be ready for this new multi-device world. We always knew that mobile was important. That is why Ecwid always has included a separate mobile version since its first public version released in 2009. This mobile version was designed to work on any phone, even very old ones. For the last 5 years phones have evolved and are now much faster. In fact these are not only phones, these are full-featured internet communication devices that have the same capabilities and performance as computers. So users expect the same level of functionality from mobile sites as from desktop sites – and sometimes they expect more. They want additional functionality based on geo-location data and multi-touch. And they hate when a site redirects them to a limited mobile version. They expect a great browsing experience regardless of what device they use – PC, laptop, tablet, smartphone, mini-tablet, or TV. Thus we are happy to announce the next generation of Ecwid mobile experience – responsive design. Now your Ecwid store can dynamically adapt to a customer’s device (smartphone, tablet, phablet, game console, laptop or Smart TV – it doesn’t matter which one) while still keeping the same buying experience. All the features available for desktop users will be also available for mobile users, yet the look will be adapted to make them more convenient for a specific device and screen size. Ecwid uses a unique automated process to decide how it should display on a particular device (keeping in mind its screen width and available features) to make sure customers will get the optimal shopping experience. The awesome part for you is that no additional effort is required – it is the same widget and the same integration code. Creating a great website experience for customers across all devices helps merchants generate more engagement and increase conversions. The following site reports that responsive design significantly increases conversion rates and revenue: www.lukew.com/ff/entry.asp?1691. Some stores saw 42% revenue growth on all devices and 377.6% revenue growth on iPhones! The feature is a separate setting in your Ecwid control panel. If you created an Ecwid account after July 10 2013, the setting is enabled in your store by default. If you created an account before that date, you can enable it on the “System Settings – General – Migrations” page in the control panel. In order to get the full benefit of this great feature, please make sure that your website where Ecwid is installed is responsive as well. Today almost every platform has numerous different responsive or adaptive themes available. Reports say that about 50%+ of mobile phone owners in the world have a smartphone, but the remaining 50% of mobile phone owners still use so called “feature-phones” – a huge market share, that should be served too. So Ecwid is a unique solution which provides a mobile experience for every mobile device: full-feature responsive design for modern devices and a separate simplified mobile catalog for feature-phones. 1. Ecwid supports responsive design, which looks perfect on any device from smartphones to desktop computers or even on smart TVs. 2. You can easily enable this feature in the control panel (System Settings – General – Migrations), or you already have it enabled by default if you created your account after July 10th. No integration code changes are required. 3. The separate mobile catalog for older feature-phones will still be available. I would like to thank all my incredible customers for selecting me to provide your website design and hosting services. Like you, my business has experienced diversification and growth. I’ve developed new skills to accommodate a wide range of needs and an ever changing virtual landscape. In appreciation for your trust and confidence I would like to invite all my customers to contact me with anything you require assistance for. If you think your website could use a little something to more accurately reflect the direction of your art or business then please by all means feel welcome to let me know. I am interested in your success. It makes what I do all the more enjoyable. Did you know that you can update your Website from your phone? Add online store to website and facebook page. How easy is it to add an a store to your website and facebook page? Tremendously easy! Contact me today for more details, or check out Ecwid plans and prices for yourself.